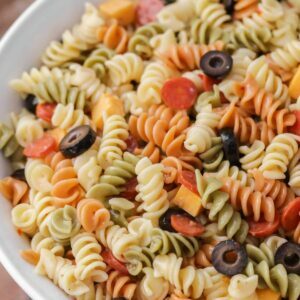 Easy and delicious Italian Pasta Salad recipe that includes Rotini pasta, olives, tomatoes, &amp; cheese in Italian dressing! It takes minutes to make and is perfect for any get together including BBQs and holidays. Add desired amount of olives, cheese and pepperonis to pasta. Pour at least half of your Italian dressing and mix well. Refrigerate for at least 2 hours. Pour additional dressing (as much as you want) before serving. ENJOY!